The stories of young girls dress in wedding outfits fill social media news feeds and are featured stories in various main stream media outlets. We look at the photos and realize that the brides are actually very young girls who are being married off to adult males. It is easy to just shrug your shoulders or shake your head in disbelief. Dismiss what is before you by stating that it is a cultural practice that has nothing to do with you. Do you ever wonder what happens to the girl brides that you see in the photo? Can you imagine your daughter, niece or cousin being married before actually reaching puberty? We reside in a culture that prohibits young girls from marrying before they reach age 18. That makes it difficult to imagine seeing a little girl exchanging vows with a man who is actually old enough to be considered her father, grandfather or older sibling. 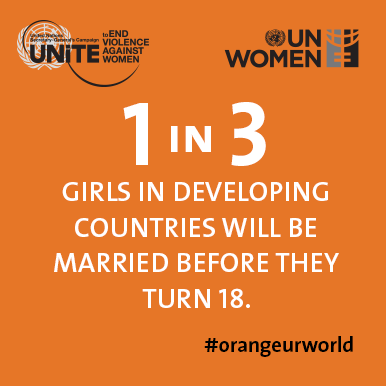 Every year, an estimated 14 million girls aged under 18 are married worldwide with little or no say in the matter. In the developing world, one in seven girls is married before her 15th birthday and some child brides are as young as eight or nine. There are consequences for girls who are truly too young to marry. Even though child brides is not a part of our culture, it is a human rights violation within the global community. We have to help bring an end to this custom! Girls not Brides has a website that provides in-depth information on the topic of child brides. There is also a page that provides you with the opportunity to become proactive against this custom. You can visit the page here.